Utah State University Eastern enrollment of 2,130 reflects a 250 student increase on the Price Campus with the Blanding Campus reporting at least 600 registered students. 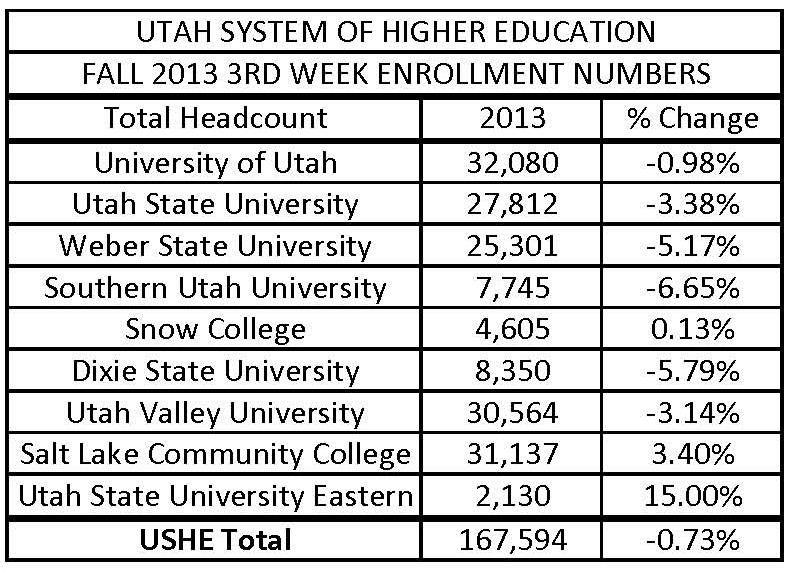 Overall, the Utah System of Higher education dropped 4,080 students or 3.68 percent of its enrollment from 2012. USU Eastern Chancellor Joe Peterson is breathing a little easier after fretting over what kind of an enrollment hit Utah State University’s comprehensive regional college might take as a result of missionary age change announced last October by the Church of Jesus Christ of Latter-day Saints. Adding to the pressure has been the college’s ongoing challenge of redefining itself since its merger as the College of Eastern Utah with Utah State University in 2010. The newly emerged USU Eastern, while part of the USU system, remains uniquely the state’s only comprehensive regional college. Nevertheless, for many, its distinctions have been somewhat eclipsed by the Logan-based university. The fact that CEU lives on, just under a new name, are clear to the chancellor and his colleagues. The knowledge that with the new name also comes added value and resources from a nationally recognized research university is also a given. Unfortunately, these facts are not nearly as clear to prospective students and to their parents who assume the college’s previous vision and mission has vanished or been gobbled up by USU, said Kristian Olsen, USU Eastern director of Enrollment Services. He considers the 2010 union to be more like a marriage. Both institutions now share the same name but they still retain important singularity with unique strengths and distinctions. USU Eastern future enrollment growth depends upon people who clearly see both institutions as one but also separate by virtue of the different needs each fill. USU Eastern, now in its 75th year, promotes itself as having the heart of a community college with the soul of a research university. It is proud to be part of the USU system and even content to be considered USU’s junior college. So long as people understand that it is a little college with big ambitions, Peterson said. The potential of USU Eastern is to be a destination baccalaureate institution in the same way that Logan is a destination baccalaureate and graduate institution, he said. “If we start cranking out 40 to 60 baccalaureates every year, people will start thinking of us not in terms of a small community college, but in terms of an emerging baccalaureate producer, like a once-young Weber State and Utah Valley University,” Peterson said. So get a good start at USU Eastern that provides exceptionally low tuition and a university diploma and go on to graduate with advanced degrees in Logan and beyond, Olsen said. But if emerging from the shadow of USU has not been enough of a challenge, the announcement by the LDS Church lowering the age at which a young man or woman could serve a mission provided plenty of new heartburn for the college, Peterson said. The announcement came soon after he had launched an ambitious college initiative, Four-in-Four, to raise total enrollment at the college by 4,000 students in four years. To be on track for this goal, the college needed to enroll 2,150 students in the current term. While the 2,129 number is just slightly short of target, Peterson said it is a welcome number in light of the school’s recent challenges. “This number represents a 15 percent growth in headcount and a 19 percent growth in Full-time Equivalent rates at USU Eastern,” he said. By this time next year, the college hopes to see another enrollment increase of at least 470 students. To reach that 2,600-student mark, the college is implementing specific strategies in the months ahead centering on degree offerings and expansion of student base among minorities and international students, Peterson said. The college’s enrollment services teams in both Price and Blanding are valuable resources in helping USU Eastern obtain its enrollment goals, but it is incumbent on the college community to be just as committed to the cause, he said. To encourage participation, the college has established a one-time grant to provide funding to departments, units, employees or faculty members to implement ideas for growing enrollment. Grant awards will range from $100 to $20,000. Proposals will be evaluated on likelihood of achieving the projected increase in enrollment, he said. On the community side, the chancellor has been actively meeting with various government and civic groups and organizations with a challenge to partner with the college to stimulate economic development, increase quality of life and create community vitality. He is telling community leaders that Eastern Utah’s economy depends upon the college as much as the college depends upon strong community support. Earlier this year, Peterson launched an ambitious building program for the college. USU Eastern’s Building Vitality Campaign lays out the college’s vision for economic and educational vitality. It makes a case for community partnering with the campus for much-needed building upgrades to improve the college’s overall curb appeal. As the community changes, adapts and grows, Peterson said, the college will be there every step of the way. It is a promise he can make because he knows that USU Eastern, as USU President Stan Albrecht envisioned, is part of one university that is geographically dispersed. The spirit of that message is that a baccalaureate offered in Price or Blanding is a USU baccalaureate.